A major goal is to photograph and display the most interesting old gravestones in Barnstable County before they are lost to the ravages of time. A related goal is to provide reasonably complete gravestone records from the earliest in 1683 up to 1900 for all Barnstable County cemeteries. The web site is complete to 1880 for most cemeteries and many cemeteries are complete to 1900. Work continues for the time period 1880 - 1900. Information about the gravestone carvers and gravestone styles is included. Reference sources for cemetery surveys done over the last one hundred years are provided for further research. If you want to search for a specific name on this large web site, go to the Google search engine at www.google.com. In the search box enter capecodgravestones+name. There should be no space before or after the + sign. For example, if you are searching for Marcy Freeman, enter in the search box capecodgravestones+Marcy+Freeman. The search result will be a listing of links to Marcy Freeman. To search for all the Mulfords, enter capecodgravestones+Mulford in the Google search box. Click on the link "Repeat the search with the omitted results included" to display all the links. Most links go directly to sections of this web site but some links go to other web sites which link back to this web site. In limited tests this search procedure works well with Google! The procedure does not work with some other search engines. If you want to view some of the more interesting old gravestones on Cape Cod and the variety of gravestone styles from the 1600's to the 1800's, follow the Quick Tour link at the bottom of this home page. Less than twenty seventeenth century gravestones, about 3,700 eighteenth century stones, about 37,000 nineteenth century stones and a few thousand twentieth century stones are included for the fifteen towns of Barnstable County. More gravestone records are being added as an ongoing project. My research indicates that only about 2,600 of the previously recorded 3,700 eighteenth century gravestones were extant in the year 2000. It appears that about 1,100 or 30 percent of the 3700 eighteenth century gravestones were lost in the hundred years between 1900 and 2000. 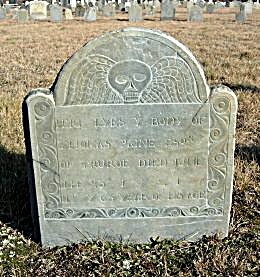 The 17th and 18th century gravestones displaying carved images including winged skulls, winged heads and sunbursts are important colonial folk art. These carved images provide clues concerning early attitudes towards death and the fate of the soul in the hereafter. Gravestone styles changed in the 19th century reflecting greater emphasis on mourning of the survivors. More and better quality photographs are being added as an ongoing project with emphasis on photos of 18th century gravestones. The Cape Cod Cemetery links at the bottom of this page lead to lists by town of all cemeteries on Cape Cod which have pre-1880 gravestones. For each cemetery the names are listed in chronological order by year of death. Each listed name includes all gravestone genealogical information. Many of the names are linked to photographs and accurate reproductions of the inscriptions. The Gravestone Carver link at the bottom of this page provides information about the early gravestone carvers represented on Cape Cod and displays collections of their work. Thirty two 17th and 18th century gravestone carvers and fourteen 19th century gravestone carvers are included. Most of the 17th and 18th century gravestones on Cape Cod were carved in the Boston and Plymouth areas with some supplied from Rhode Island and Connecticut. Many local Cape Cod gravestone carvers were active carving marble gravestones in the 19th century. Included in the gravestone carver section are links to a discussion of the meaning of the carved images and to a suggested reading list about the gravestone carvers. The Epitaph link at the bottom of this page leads to interesting epitaphs commemorating or describing the deceased. The epitaphs are organized by cemetery and they are listed in chronological order for each cemetery. Epitaphs were uncommon before the mid 1700's. The Cemetery Survey links at the bottom of this page provide reference sources for surveys done over the last one hundred years for each cemetery. While this web site is a good source for pre-1880 gravestone records, it does not include all pre-1880 deaths in Barnstable County. Many persons did not have permanent grave markers especially in the 1600's and early 1700's. Most early burial sites were unmarked or marked with fieldstones, wood posts or mounds of earth all of which have long since disappeared. Also, the web site does not include gravestones which disappeared during the 1700's and 1800's since most available Barnstable County cemetery surveys date back only to about 1900. For more complete information on all deaths, you must research other sources such as town vital records. Age at death on older gravestones generally is expressed as "aged 75 years", "AEt. 75" or "died in her 75th year". For the listed names on the web site, age is the number displayed on the gravestone. Each of these examples would be listed as age 75 even though the latter two examples actually are age 74. The age issue is clear when the complete gravestone inscription is recorded on the web site as is done with photos. If there are questions about age , contact rpcarlson@comcast.net. The web site background records may provide more detail about ages. Your emails on many subjects including contributions of photographs and genealogical information are appreciated. Email inquiries will receive prompt response. You are welcome to freely download the information and images on this web site for non-commercial genealogical purposes. However, lifting large numbers of photos for other gravestone web sites is not allowed. There were about 1.1 million pages viewed on the web site in 2011. New infomation last added by Robert Paine Carlson May 2012.